Although you can open a separate Search window, one of the easiest ways to search for files and folders in Windows 7 is to search straight from the Start menu. Fortunately, Windows 7 has made massive improvements to its search technology. Windows 7 uses a more advanced search index that continuously monitors every file and even the words within most of your files. When you search for a file or folder in Windows 7, you are much more likely to find it than you were with Windows Vista or Windows XP. 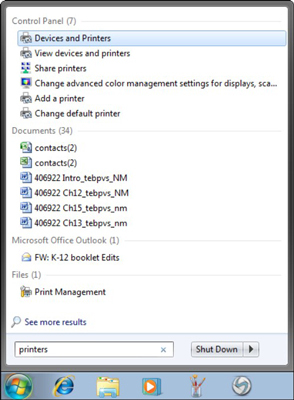 The Search field and results in the Start menu. A list of search results appears divided by the location of the results. Click the See More Results link. The Search Results in Indexed Locations window. The Search Results in Indexed Locations window appears. Click View to cycle through the various options of icon sizes or text listings. When you locate the file you wanted, double-click it to open it. If you don’t see what you’re looking for, choose the Folder and Search Options command from the Organize menu to modify Search settings. You can alter the locations to search, indicate whether to find partial matches for search terms, and more. 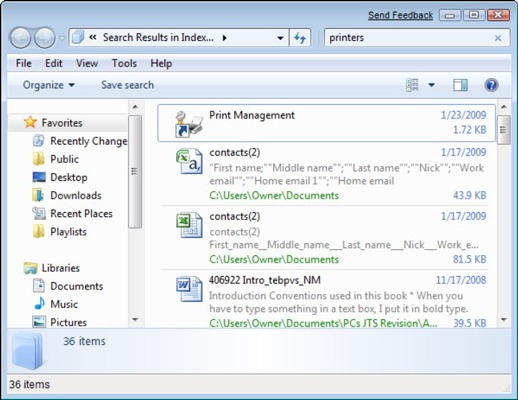 In Windows 7, you can save the results of a search so that you can review them later. To save a search, click the Save Search button, provide a filename and type, set the location to save it to, and then click Save. The search results are saved as a search folder on your computer in your username folder.